We sang that song all day while we explored the game of baseball. Creative Family Daddy is a big baseball fan and it was fun for the girls to explore one of his interests. We made cardboard baseball bats and read a few baseball books. 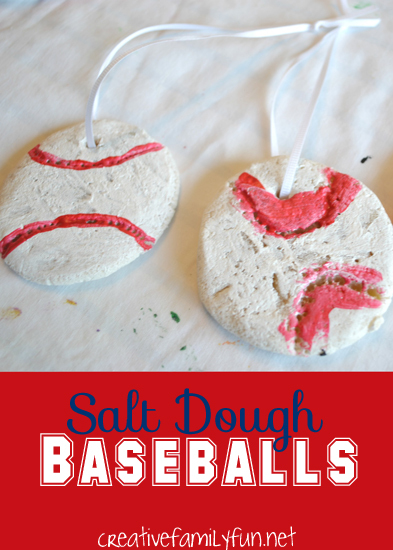 Plus, we made these salt dough baseballs as a little gift for him. Mix together the dry ingredients, then add the water. Combine with a spoon or hands if needed. Knead the dough until it is soft and firm. 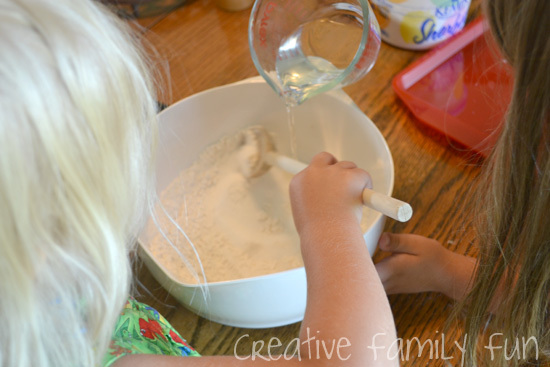 The salt dough is easy enough to make that I let the girls mix it all up themselves. 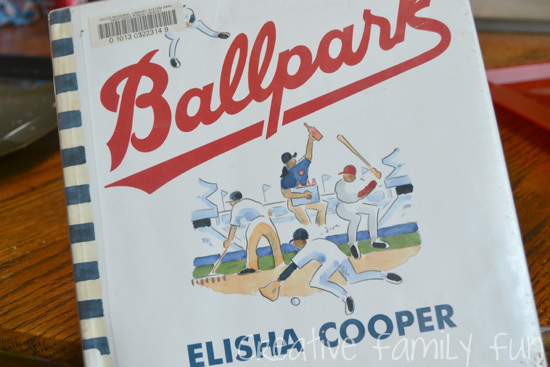 While they were kneading their dough, I read this delightful book by Elisha Cooper, Ballpark. The words whisk you away to a ballpark where you experience all the delights found at a baseball game. Once we were fully immersed in the sights and sounds of a ball game, we got to work making our baseballs. After the girls rolled out their dough to about a quarter-inch thick, they took one of our drinking glasses to cut out the round shape. We then took a drinking straw to make the hole at the top. 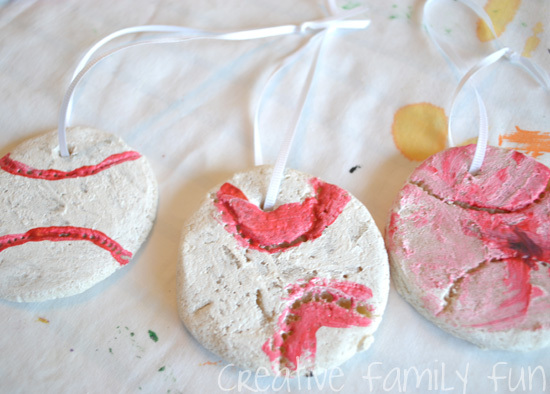 We were planning on stringing ribbon through our baseballs so that Creative Family Daddy could hang them up. We used toothpicks to add the extra details on the baseballs. Then it was time to let them dry. You can leave them out to dry, but I’ve found that this never works well. I put ours in my oven at the lowest temperature (250 degrees F) for a couple of hours. This did the trick. If you try this project at home, I would recommend just putting your baseballs straight in the oven for a few hours. When they were finally dry and hard, we got out the paint and painted our details. 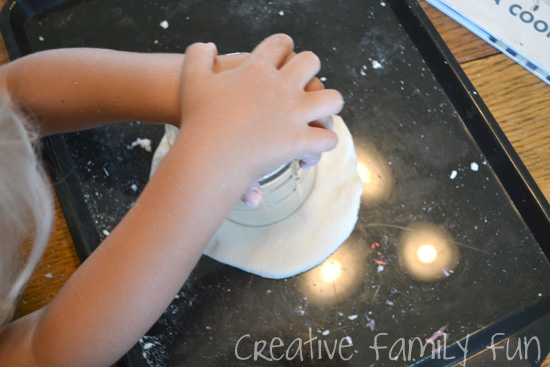 We used acrylic paint on our salt dough and it worked well. Now Creative Family Daddy has a fun gift from the girls to hang at his office. 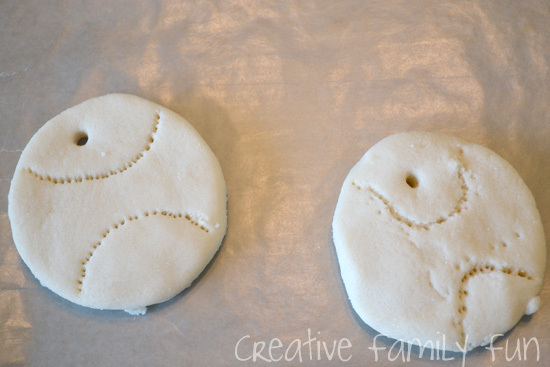 Have fun getting crafty with baseballs! Ages: Preschool (age 3/4) and up. 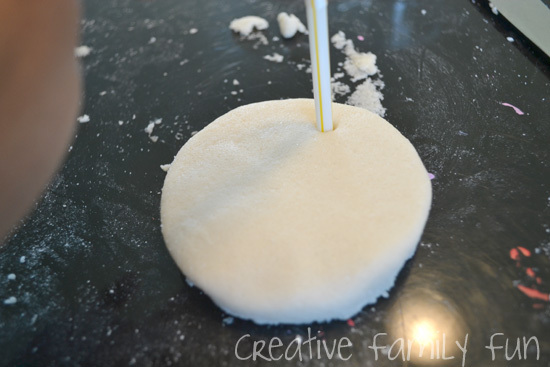 Time needed: about 30 minutes for crafting with your salt dough and a 2-3 hour time span for drying in the oven. You’ll need another 15 minutes to finish up your craft after it’s dry. Notes: The longest part of the process is the drying time. Give yourself enough time to let your baseballs dry properly.